If you've been reading our blog for awhile, you know that we love taking our dogs just about everywhere with us! We're always looking for great dog friendly restaurants, dog friendly activities and other destinations that welcome dogs. We have recently discovered some great Dog Friendly Wineries on Long Island, New York! Yes, Long Island, New York has a Wine Country and it's pretty darn good! The sandy soil and moderate climate found on Long Island makes it ideal for growing grapes. 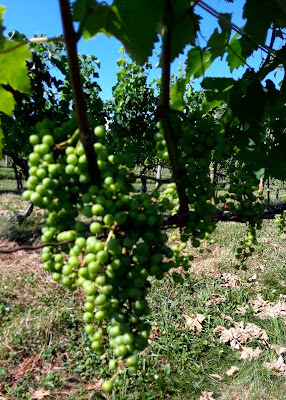 Although grapes have been grown and vines sold on Long Island since the late 1600's, according to the Long Island Wine Council the first Long Island Vineyard wasn't planted until 1973. 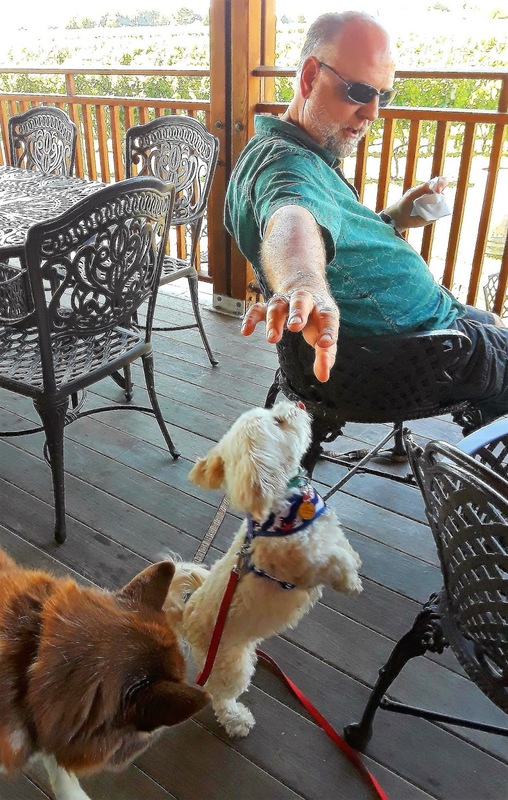 Several vineyards on Long Island, NY are dog friendly! Upon visiting Long Island in 2,000, world renowned Australian viticulturist Dr. Richard Smart said that the soils of Long Island "are among the finest soils for grape growing that I have ever seen in the world" Wow, that's quite a testament coming from a leading global consultant on viticulture methods! Sandy soil and a moderate maritime climate are ideal for growing grapes that make the delicious wines of Long Island! As you travel East on Long Island, the Island splits into two sections, the North Fork and the South Fork of the island. This split begins at the town of Riverhead, about two thirds of the way to the Eastern end of the island. The North Fork of the island is where most of the wineries are located in towns like Riverhead, Mattituck, Peconic, and Southold. There are a couple of wineries on the South Fork as well, but the South Fork is better known for the beautiful regions of The Hamptons and Montauk. 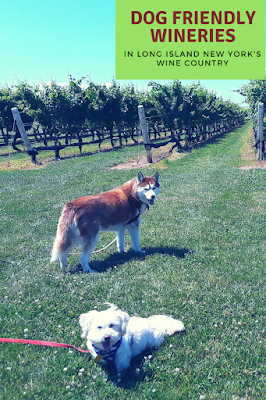 We've visited several vineyards on Long Island over the years, but this was the first time we visited wineries on Long Island that allow dogs! It's the first time, but it will certainly not be the last. 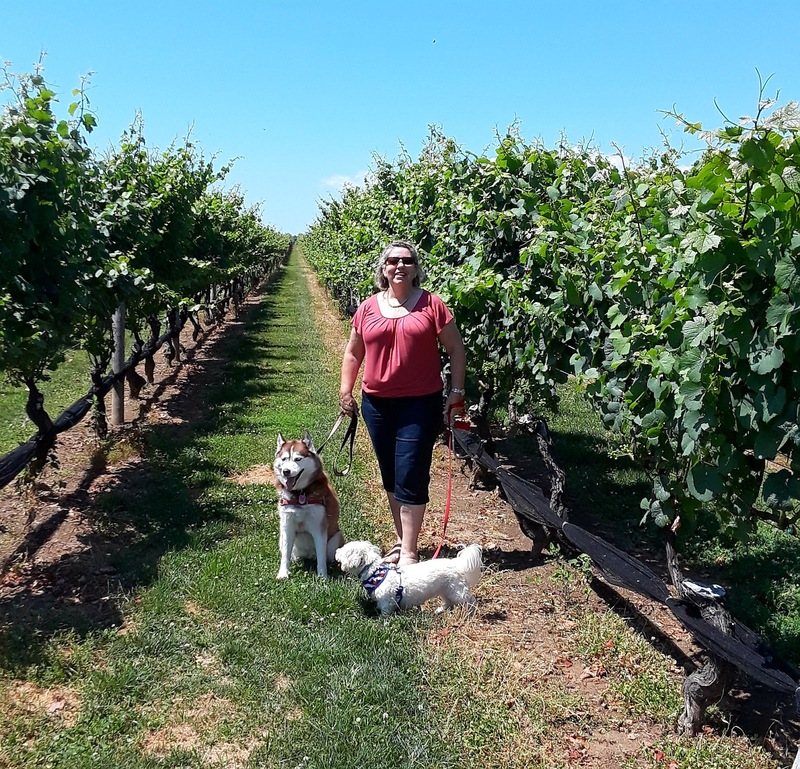 We had a wonderful time at two of Long Island's pet friendly wineries, and so did our dogs, Icy and Phoebe! For our first winery visits with the dogs we chose Pindar Vineyards in Peconic and Macari Vineyards in Mattituck. Visiting two wineries with dogs was plenty for one day. We wanted to take our time and enjoy the wine and the beauty of the vineyards, and didn't want to tire the dogs out too much. We'll be heading back out to visit a couple more pet friendly wineries on Long Island in the coming weeks, so stay tuned for that! Our first stop was Pindar Vineyards in Peconic. I did a tasting of about 5 different wines (don't worry, the tasting size is super small!) and John had just one glass of wine since he was our driver. We bought a couple of cheese sticks and a small package of crackers to enjoy along with our wine. They had a covered patio with lots of shade and a beautiful view of the vineyards. The gentle, cool breezes off the water were delightful! I had brought chew sticks for the dogs, but of course we couldn't refuse sharing some of our cheese sticks with them too! We had to share some of our cheese sticks with the dogs. I mean, who could say No to that face!? I really like Pindar's green initiatives, one of which is the use of wind in their wine production. They installed a 156 foot tall Turbine that will power at least 80% of all winery operations. We applaud their sustainability efforts! There is a beautiful Sunflower Field on the property as well. You can stroll through the field with a glass of wine in hand, admiring the bright, "happy" flowers. You can even cut some sunflowers to take home for just a dollar or two per stem. They provide the clippers, you choose & cut your flowers. 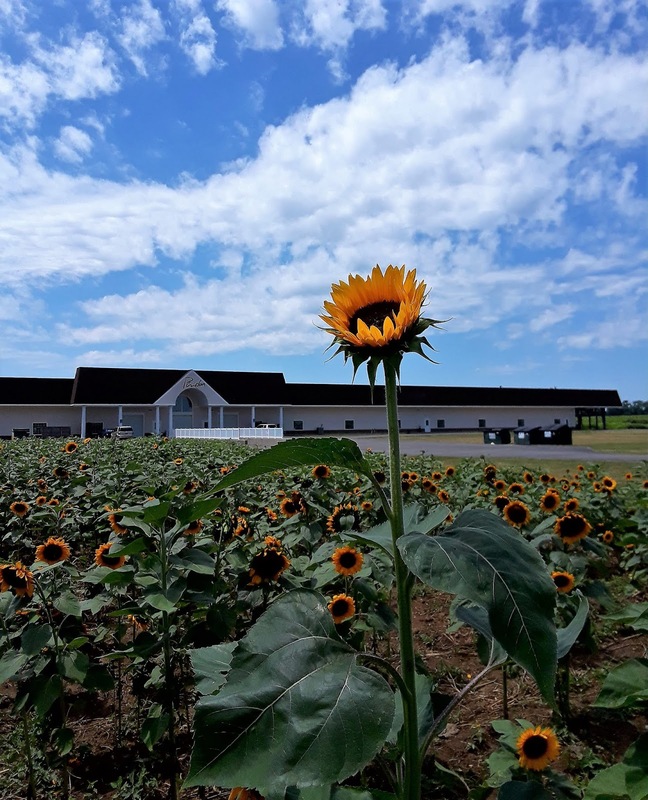 Pindar Vinyard has a beautiful sunflower field. Sunflowers can be cut and purchased by the stem. We left Pindar Vineyards with 2 bottles of wine in tow. A bottle of Pythagoras red wine for my husband and a bottle of Winter White for me. Delicious!! Our next stop was Macari Vinyards in Mattituck. I didn't do another tasting, instead I had a glass of a sparkling Cabernet that I really like and john had a glass of Merlot. 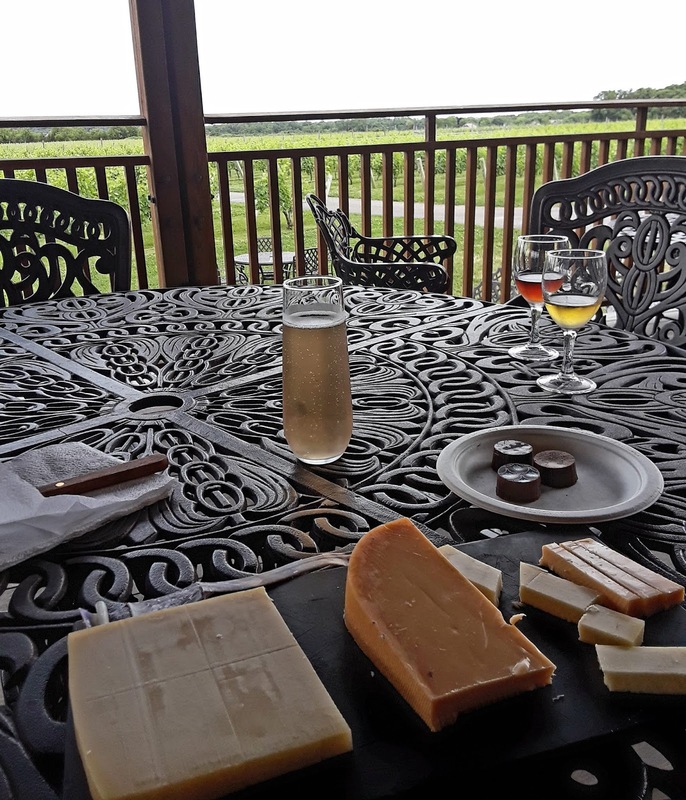 In addition to tasting flights, Macari offers a boxed cheese, cracker, and aged salami snack that you can enjoy with your glass or bottle of wine outside on the patio. You can also buy these items a la carte. There was enough in the boxed "snack" to consider it lunch for two. There was also enough cheddar cheese and salami left over for a delicious omelette du fromage the next morning! Macari Vineyard offers a la carte or boxed snacks of cheeses, crackers, and aged Italian salami. Yum!! 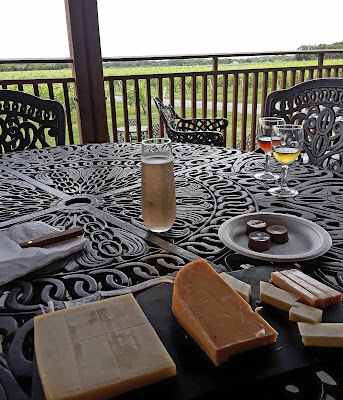 We enjoyed one of the boxed snacks with our wine on the covered patio overlooking the vineyard. It was perfect, sipping wine and snacking on cheese and crackers while looking out over the beautiful vineyard. The breezes that came off the Long Island Sound were so relaxing, even the dogs were loving the cool breezes! We made sure there was plenty of shade and kept the dogs well hydrated. Of course, we had to share a little of our cheese and salami with the dogs! Phoebe jumps up to catch a bit of cheese! The Macari Vineyard started in the 1990's. The Macari farm uses an ecological and holistic approach to growing their grapes. That includes a field devoted entirely to compost, with a composting program that utilizes a herd of Long Horn Cattle and a couple of horses. If you decide to visit wineries on Long Island, New York, there are lots of Long Island Vineyard Tours available. I like the idea of a tour because you can visit several wineries and participate in wine tastings to your heart's content without having to worry about driving afterwards! It's probably the safest way to do a wine tasting tour, don't you think? Have you ever visited a dog friendly Vineyard? If not, would you like to? Leave us a comment and let us know, we LOVE hearing from you! We have never been to a vineyard but it is awesome that you found dog-friendly places to visit. They are gorgeous too! I'm so excited that we found a few dog friendly vineyards here on Long Island. We'll be visiting a couple more in the next month or so. 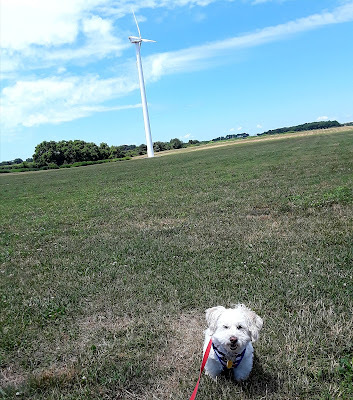 We have never visited a vineyard, but there are some in southern Michigan and I hope to make a trip some day (not sure if they are dog friendly or not). I love the photo of the sunflowers and how fun that you can stroll through the fields with a glass of wine. This is our first visit to a winery too! Carol B. told me that she visited one on Long Island so I started looking for other dog friendly wineries out here and voila! I found a few. I'll be visiting those as well. It's such a fun day, especially with your pooch beside you. I loved that photo too, thanks! It's so relaxing and peaceful in that sunflower field. Please do if you have the chance. They are both definitely worth the trip! 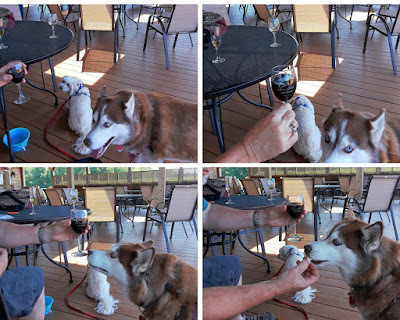 If you ever get farther upstate, the Finger Lakes has tons of dog-friendly wineries as well. Thanks for letting me know, Pamela! I'd love to take a trip up there, it looks so beautiful. What's better than dogs and wine - well maybe dogs and coffee ;) I have always wanted to tour a vineyard, we have several not that far from us unfortunately, they are not dog friendly :( Maybe I'll have to go visit this one! I know right!? Just throw in a bit of chocolate and it would be perfect! I was so pleasantly surprised that there were several dog friendly wineries on Long Island. I have a couple more I'll be visiting soon. I love going to vine yards but have never taken Layla and I think that the next time I will. I always love reading about the places you visit as I wish I could do so many of them. Thanks! I'm so happy you enjoy our travel posts. I'll bet there are some fabulous wineries in the Napa area that would welcome Layla. You should go! We live so, so close to long island but haven't really explored it much. Thanks for the heads up, I think I'll be more motivated to adventure there if I can go places where my dogs can join me! Really? We should get together some time, maybe do a doggie play date! I'm the same way, I love going anywhere I can bring my dogs. I hate leaving them behind. I had no idea Long Island had wineries!! Sounds like you had a great day out with the dogs and hubby, so much better than having to leave them behind. Love reading how many dog friendly places there are. They always had two, for many many years but in more recent years a lot more have cropped up & now there's actually a Long Island Wine Country! It was so lovely being able to bring our dogs to beautiful vineyards, it's a great day. I love this. I think every region has a wine region now. I'm in Ontario, and I'm thinking of doing a 'dog-friendly wineries of Niagara' guide book, though it might have to be expanded depending on how much I find. If I'm ever in Long Island with my pooch, I'll head to these. I know, it's amazing how many areas can grow good local grapes and make good wine. I think your guidebook is a great idea! You always do such great things with your dogs, and you must have such a great time! You're so lucky you can take them so many places. Your posts always give me ideas for things to do. Aww, thanks Dawn! We do have a terrific time with the dogs, I love bringing them on our adventures and travels. You would love the wineries on Long Island, it's such a fun day. Sure, you are welcome to quote me as long as you give credit to my blog. Please don't copy/paste whole sections of my content though. Thanks for stopping by the blog and for asking! That sounds like a great day! I am really impressed that Pindar Vineyards is using wind power. I bet Icy and Phoebe can't wait to go back and have more cheese and salami! I was so impressed by the wind turbines too, I didn't know anyone was using them out here. We all enjoyed it and the dogs loved the scraps of cheese & salami! Well that's fun! I would love to take one of those tours I think - no driving! Lovely pictures too. It's a great day, especially when the weather is nice. If you don't have to drive it's even better - no worries about sampling too much wine. Looks like you, John, Icy, and Phoebe had a great time exploring two different wineries. I haven't visited a winery since getting our pups, but I think I may need to add this field trip to our list. Your day just looks so relaxing, and not just because you're drinking wine! LOL! Being outside, walking around a bit, snacking here and there. The whole picture just looks very serene. I'm also impressed with Pindar Vineyard's wind turbine. I bet over time that will save them a lot of money! It really was super relaxing and enjoyable. The gentle breezes off the Long Island Sound made it even better. We plan to visit more wineries before the weather gets too cool. I loved seeing the wind turbines, it was a nice surprise to see them being so environmentally conscious. It's been so darn hot here we didn't have many days like this - but this trip out to the vineyards was just wonderful! I'm sure you have some nice wineries in NZ, if you go be sure to share your adventure with us. What a wonderful way to spend a day or two with the doggie companions! Totally envious of that sort of climate and so pleased that they use eco friendly initiatives... as well as serving such fine food too! It really was a great day, so relaxing and beautiful weather. A perfect way to spend the day! I'm so happy to see more wineries (as well as breweries) cropping up around the country - I'm liking this trend! LOL! I'm sure Cookie can be your designated "driver" for the day. I always love your day-tripping to dog-friendly places! Pinbar looks beautiful with all the sunflowers! Seems like such a happy place to be! I am sharing this on Pinterest and also sending to my niece who lives on Long Island and has Pomeranians...I think she'd love to visit some of these places (well, I would, too)! Thanks for such a great list - and love your photos! Aww, thanks so much Dorothy! I'm really glad you enjoy hearing about our little adventures with the dogs. Thanks so much for sharing my post, it's much appreciated. I bet your niece would love either of these wineries on Long Island's North Fork. It's not nearly as crowded as the Hamptons & Montauk, so it's really pleasant. I bet her Poms would greatly enjoy it too especially if they got a bit of cheese or salami at the winery! Oh, and pick up a Briermere Farms Pie on the way home - to die for!! I don't blame you for sharing that bit of cheese with your dogs - I do the same thing! Of course, how could we not! That would just be cruel wouldn't it LOL! I have visited some private dog-friendly vineyards in California, Chile and Australia over the years. I love red wine, cheese and dogs so sounds like a perfect day for me. I didn't know about the Long Island Vineyards. Oh, that must have been spectacular! It really was a perfect day. If you make it down here before cold weather hits, it's a great day trip from NYC or anywhere on Long Island. If you do ever make it to NY you must let me know! Shows how much I know. I thought wine country was on the west coast. This looks like a wonderful place. It is! California is THE place for vineyards but in recent years Long Island has developed quite a wine country for itself. The wines here are pretty good. I only wish we had true Champagne, my all-time favorite alcoholic beverage! But of course, we can only get sparkling wine in this part of the world - it's ok but not quite the same. Dogs & wine & NY...My idea of heaven! I know right!? For me, throw in some Champagne and chocolate and it is Truly heavenly!